3.8% scored Social Conservative out of 60410 total takers for the new Version 7. 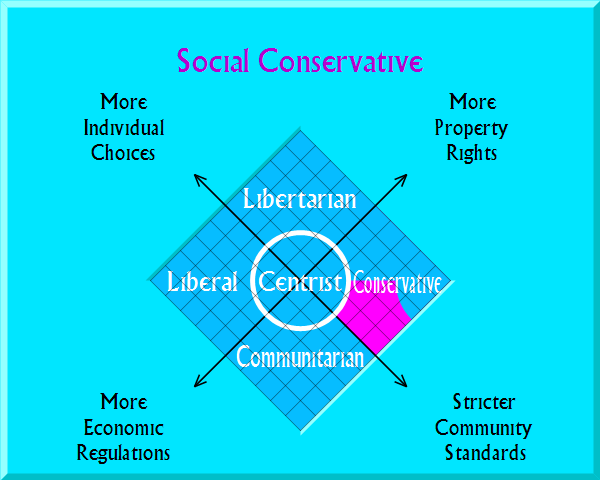 2.1% scored Social Conservative out of 302551 total takers for the old Version 6. You desire less government control of the economy. On the other hand, you call for considerably more active government government in other areas. You appear to be a good solid Republican. However, you might sometimes prefer the Constitution Party candidate. This is a strange year. The Republicans have been taken over by a candidate who would better fit in the old Reform Party. Donald Trump is possibly in your area of the Nolan Chart. He has waffled between Reform, Democratic, and Republican parties, but he is currently tacking conservative -- with an authoritarian vibe. While he is no libertarian, he has had quite a libertine career: flaunting wealth, running casinos, selling Vodka, serial adultery... Many social conservatives have thus gone "Never Trump." If you are one of them, where do you go? 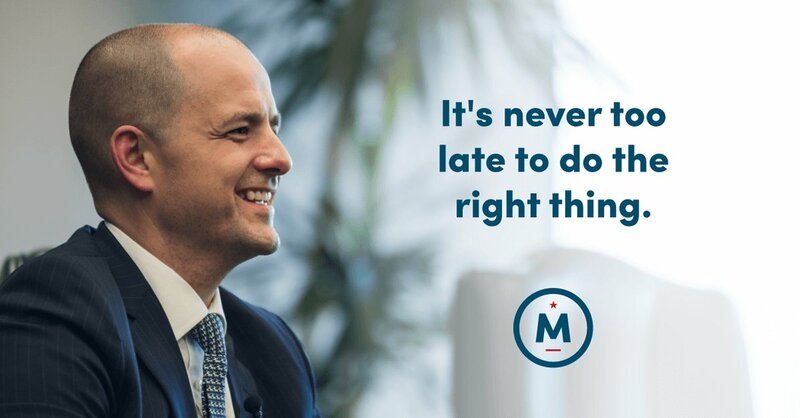 If you are part of the Never Trump movement, you might want to check out the last-minute campaign of Evan McMullin. 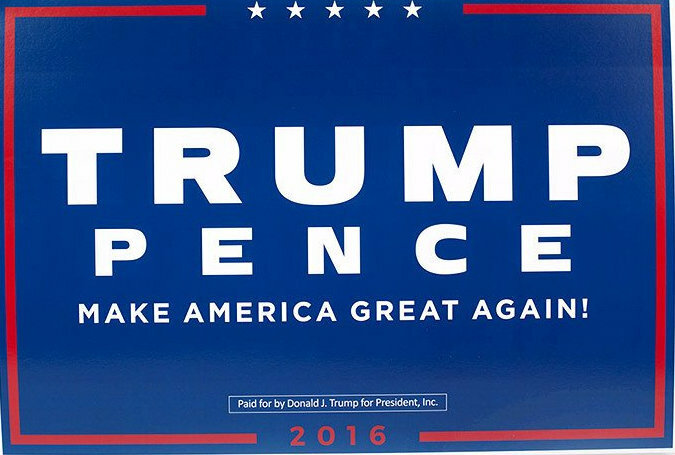 Given how late out of the gate this campaign is, it seems a long shot. And the issue statements are short and fluffy. So do your own research. Imagine a future of private property and propriety. It's getting difficult these days, but I have some conservative utopias for your reading pleasure. Enjoy. And be sure to read the 2012 Republican Party Platform. The American Solidarity Party is a Christian Democratic party which is pro life across the board. They call for generous welfare benefits funded by ground rents, and for backing off of some of the more punitive aspects of our justice system. But unlike most left wing parties, they would make abortion illegal and support religious freedom even outside church buildings. The U.S. military can take out evil dictators quite readily. Establishing a stable democracy afterwards is another matter. Wonder why? The answer lies in the flaws in standard voting systems. In a deeply divided nation voting systems matter greatly. Have a look at Range Voting. Study it. The math is compelling. If we are going to play World Police, let's do it right. From your answers it appears you believe that government should actively enforce some aspects of personal morality. If you think that such enforcement should be based on Christian (or Jewish) principles, here are some in-depth Bible studies on the matter for your consideration. In Old Testament times, the people of Israel were supposed to aggressively enforce some aspects of personal morality. Adultery, idol worshipping, homosexuality, and Sabbath-breaking were all death penalty offenses. But in other ways, the Old Testament Law was quite libertarian, more so than U.S. law today. Recreational drugs were legal under Biblical Law. Prostitution was legal under certain circumstances. There were no prisons. Penalties for property crimes were in many ways less harsh than U.S. law. Indeed, the Bible contains a recipe for something close to anarcho-capitalism! But should Christians be enforcing the Old Testament Law? Even in ancient times, the Law was enforced only in the Holy Land. The New Testament calls for forgiveness, not enforcement. This is not to say that Christians should water down calls for righteousness, merely that they have less mandate to enforce righteousness by force than ancient Israelites. One can make a good argument that Christian standards of morality should be higher than the mandates of Old Testament Law. However, this is not a justification for enforcement by The State, because Christianity is not for everyone. The Bible says so. And when Christians overlook this important fact, they are tempted to either water down the meaning of Christian or resort to forcible conversions. But if not are all called, what is the fate of unbelievers? And if not all are called to be Christians, to what extent can we call the United States a Christian Nation? If you are tired of the expense, bureaucracy and subsidized immorality of the current welfare state, check out God's Welfare System. This article shows shows how the poor were supposed to be taken care of during Old Testament times. Many of the ideas are useful to this day, ideas on how to help the poor without subsidizing irresponsibility. Would you like to fire a hundred thousand bureaucrats? Would you like to do something about the hoards of illegal immigrants? Would you like to restore federalism and bring most domestic government back down to the state level? Then replace the federal welfare state with free money for all U.S. citizens. As a bonus, you'll make marriage economically worthwhile for the poor again. Regardless of your core political values, this list of books on law, economics, politics, and social problems should add useful items to your mental toolset. These books (and one TV series) range from easy to challenging.